WT Henley Pole Mounted Cut-outs ensure a safe and reliable low voltage overhead (pole-mounted), 400 amp, cut-out providing rural dwellings with power supply. Compact, single pole WT Henley overhead (pole-mounted) cut-outs up to 400A are suitable for low voltage cable termination of stranded/solid, copper or aluminium conductors, 70-300sqmm. Pictured : WT Henley Overhead Pole Mounted Cutout. Mechanical terminals with shearhead bolts replace the studs usually used in overhead cutouts - this eliminates the need for connecting lugs and specialised tools to ensure a safe and reliable joint. The slide front cutout cover enables simple jointing of copper or aluminium conductors up to 300sqmm. 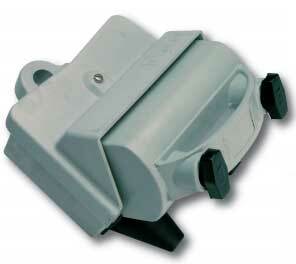 WT Henley overhead (pole-mounted) 400A cut-outs are suitable for pole, cross arm and wall mounting. Manufactured from glass reinforced polyester, WT Henley fused overhead cut-outs have virtually replaced traditional porcelain cut-outs for pole type cable terminations.